ORA-00942 means that you have no such table in your usable scope. In reality, almost every SQL developers have ever seen the error before. The real causes of ORA-00942 may be varying from case to case though. Now let’s take a look at some error patterns of ORA-00942 and their solutions described in the following sections. Let’s see an example, which is to query a table owned by someone else. It’s a little embarrassing, because this error pattern is caused by a very elementary concept on using the database system. By default, we cannot use other user’s objects until we are granted to do it, otherwise, we will see ORA-00942. You might think that every user knows the basic knowledge, actually, some don’t. To know all tables that we can use, please query ALL_TABLES dictionary view with specifying table owner. As we can see, there’s no matching table from owner HR in this case. In fact, not only by querying ALL_TABLES, there’re several ways that can instantly check if the table is granted to you to use. The solutions to ORA-00942 are simple, you can either ask DBA or the table owner for the object privilege SELECT. System privilege SELECT ANY TABLE is also a cure to ORA-00942, but it may be too strong to be granted to a normal user, especially when the user is used by public database links, it would become a security hole, even though some restrictions are imposed on database links. That’s why we should keep least required privileges of the account that accesses a database. In some cases, users may need SELECT privileges on all tables belong to other owner, but granting each of every tables could be a tedious job to do. DBA had better know some tricks about how to grant all tables owned by other user at a time in order to avoid occasional ORA-00942. Let’s study a more advanced case about ORA-00942, which involves DBA who tried to CREATE VIEW for a third party. ORA-00942 in here did not mean that DBA has no right to use the table, it was meant for the third user SH in this case. Try anther way around by creating a synonym for SH. Although the synonym was created successfully and no ORA-00942, it’s useless until the base table was granted to the grantee. As has been noted, the principle is always the same, the user must have proper privileges to use other’s object. What will see if we try to describe the synonym? In the above, we tried to describe the synonym, but it handed over the base table eventually. Consequently, ORA-04043 was thrown instead of ORA-00942 for the unknown object. Let’s try to add the foreign key again. As we can see, a reference constraint that points to another user’s table was added. Now it’s time to know some points on the differences between SELECT privilege and REFERENCES privilege. SELECT privilege is not the right choice to solve ORA-00942 in such error pattern. As a result of only SELECT privilege presents, you will get ORA-01031 instead of ORA-00942 in this case. For convenience, you can grant SELECT object privilege to a role, but you cannot grant REFERENCES to a role, which will fail with ORA-01931. There is no such system privilege called REFERENCE ANY TABLE, just like SELECT ANY TABLE available to DBA to grant to. First of all, we granted SELECT privilege on a table EMPLOYEES of HR to SH, which means SH can query EMPLOYEES even though it does not belong to him. As the user SH, we tried to query the table. Why is ORA-00942? Haven’t we been granted to access the table? This is because we forgot to prefix schema name. Without schema name prefixed, SQL parser will search for the table in the scope of current user, SH. We had better to query USER_TABLES to list all tables that belongs to current user SH for sure. We can have two solutions to ORA-00942 here, the first one is very straightforward, just prefix the schema name. Prefixing the schema name in every kind of statements could be the safest way to use schema objects, especially when you are using a database link to retrieve data from the remote database. By this way, we can ignore the schema name. In other words, we don’t need to prefix schema name. That’s the trick to avoid ORA-00942 without changing your statements, but don’t forget to revert the setting afterwards. Do you notice that? I misspelled the table name deliberately, as a result, ORA-00942 was our company. In fact, misspelling happens all the time. Just like we wanted to type “like”, but we typed “liek” eventually. Please make sure the identifier is correct by querying ALL_TABLES to list the correct table name that we can use, even though they belong to other users. If you found nothing wrong, just call someone else to help you to identify the mistake. It’s especially helpful when you cooperate with a senior developer. Some GUI tools like Toad, PL/SQL developer or SQL developer can also reduce ORA-00942 by automatically completing the object name in their SQL editors. For sqlplus users, sorry, it does not have spell checker. Seriously, I have talked about database object naming rules a lot including non-quoted and quoted name and how to use them properly. This is exactly the same case related to naming rules. First of all, we create a table small in exact form by quoting the name. Without quoting table name, the query was looking for an upper-cased table named SMALL by default, not small from SQL parser’s eyes. Consequently, SQL parser found nothing and threw ORA-00942 to notify this issue. This might sound strange, but this is how the exact form, the quoted naming rule works. Just use exactly the same quoted name as we provided in table definition. Good! At least we have no ORA-00942 this time. For proving this, we may check the original table name by this query. Eventually, it’s a lower-cased table comparing to normal upper-cased tables. Furthermore, we can create a table with the case-insensitively same name. There is no trick, because I create an upper-cased table named SMALL which differs from small within the namespace of current user. Also, there is no name collision, no ORA-00942 as long as they are essentially different. Let’s see an example of ALTER TABLE. The error message told us that it tried to find a table named HAPPY_EMPLOYEES, but nothing is found. You can not even DROP TABLE. As a matter of fact, the object is not a table, even though it looks like a table. Now, we have to know what the object type it is. A dictionary view USER_OBJECTS can be helpful. 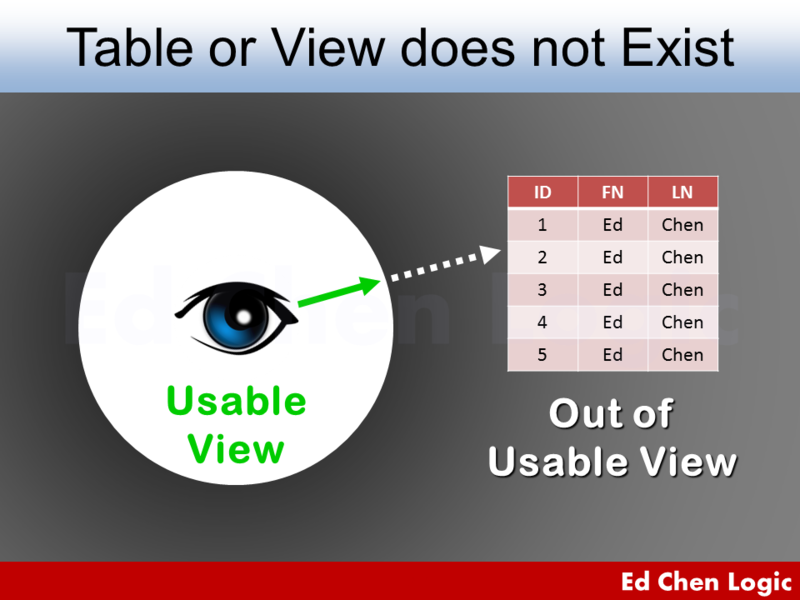 Not only views, but synonyms are also schema objects based on tables. That is to say, no matter what you are trying to do is ALTER TABLE or DROP TABLE, you should do it on their base tables in case of ORA-00942.